"Marital Life Is like a Rocky Hill Path"
Boozhoo, aaniin indinawemaaganag, gidinimikoo miinawaa: Hello relatives, I greet you again in a good way! I am Zhaawano Giizhik. Welcome to part 7 of my blog series titled Teachings from the Tree of Life. 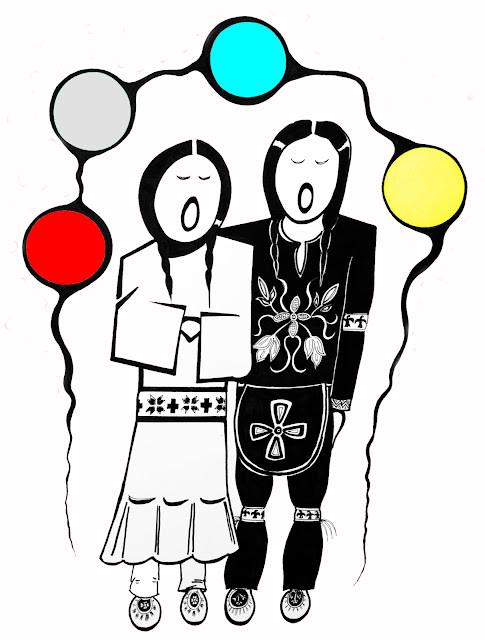 Today I share with you a Teaching about the nature of what my Anishinaabe ancestors called niibawiwin, or marriage, which was considered the strongest of bonds. The Teaching is woven around a beautiful painting by Anishinaabe Medicine Painter M. Kinoshameg and a pen-and-ink drawing by myself, as well as a set of wedding rings that I designed at my workbench. 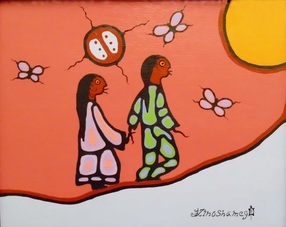 To the Anishinaabeg, a wiijiwaagan (literally, “he or she who goes with”) is a life partner to commit to unconditionally, to walk and be with in all the joys and sorrows and through all aspects of bimaadiziwin (life). 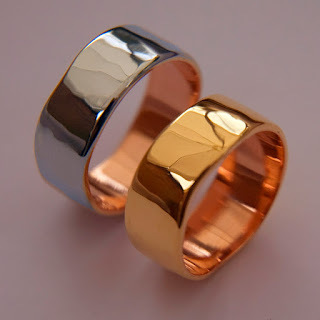 The overlay wedding bands that feature today's story are titled bakidaabikamon. 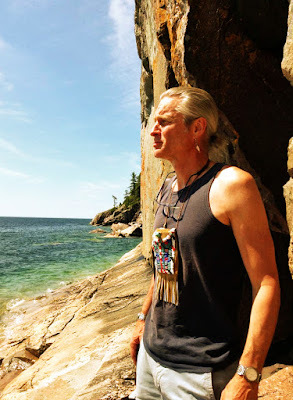 Its literal tanslation is “The Road Goes over a Rocky Hill.” The rings were designed in the spirit of my Anishinaabe ancestors, whose teachings have always been parabolic and aimed at gaining wisdom by experience and reflection. The rings are hand-hammered of 14K palladium white gold and 14K red gold (left) and 14K palladium yellow gold and 14K red gold (right). “ You will share the same fire. You will hang your clothes together. You will help each other. You will walk the same trail. You will look after each other. ¹ Source: Basil Johnston, Ojibway Ceremonies, University of Nebraska Press Lincoln and London, First Bison Book printing 1990, p.p. 91, 92. My name is Zhaawano Giizhik. As an American artist and jewelry designer currently living in the Netherlands. I like to draw on the oral and pictorial traditions of my Ojibwe Anishinaabe ancestors from the American Great Lakes area. For this I call on my manidoo-minjimandamowin, or "Spirit Memory"; which means I try to remember the knowledge and the lessons of my ancestors. The MAZINAAJIMOWINAN or ‘‘pictorial spirit writings’’ - which are rich with symbolism and have been painted throughout history on rocks and etched on other sacred items such as copper and slate, birch bark and animal hide - were a form of spiritual as well as educational communication that gave structure and meaning to the cosmos. Many of these sacred pictographs or petroforms – some of which are many, many generations old - hide in sacred locations where the manidoog (spirits) reside, particularly in those mystic places near the coastline where the sky, the earth, the water, the underground and the underwater meet.